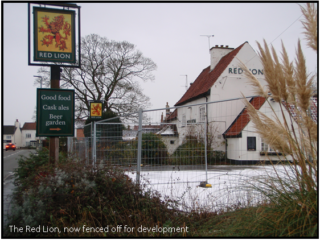 You are here: Home>New contributions>Farewell to the Red Lion? 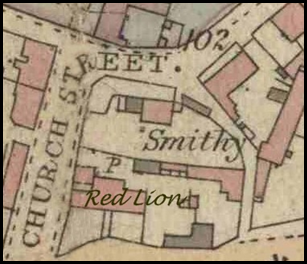 Detail of the 1884 map of Bottesford, showing the Red Lion on Grantham Road. The forge and wheelwright’s shop were in the Red Lion yard. 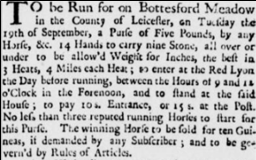 Stamford Mercury, 7th September, 1738. "Advertisement for races on Bottesford Meadow. 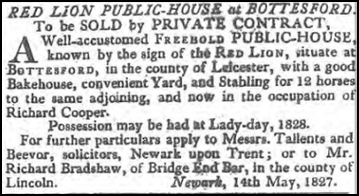 Entries to be placed at the Red Lion, Bottesford"
The Red Lion for sale in 1827 (from the Stanford Mercury). 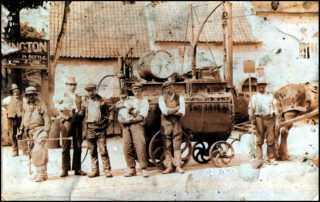 Road Gang outside the Red Lion when Ernest Lamb was landlord. 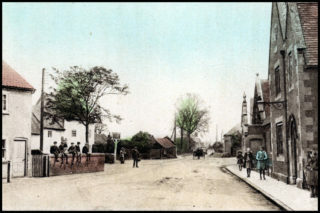 A street scene c.1920 showing Grantham Road looking east, with the Red Lion on he left and the village school on the right. 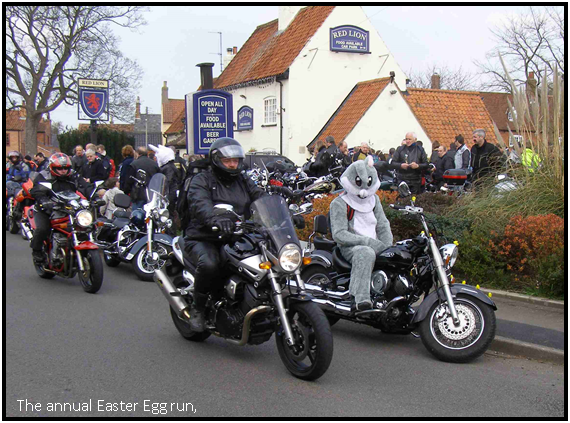 Start of the bikers' charity run from the Red Lion, sunday before Easter, 2014. The Red Lion has been part of Bottesford life for around 300 years. The first reference we have come across is in the Stamford Mercury, September 7th 1738, but it may well have been in existence as an inn before this. 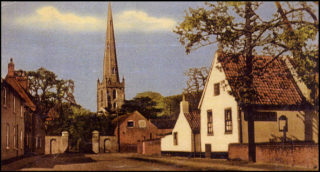 It is a Grade 2 Listed building, on the corner of Church Street, part of the group of old buildings close to the medieval cross which form the village conservation area. 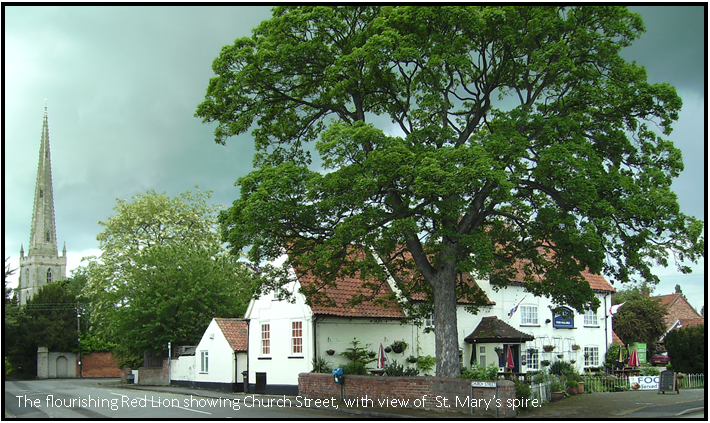 Since the pub’s closure, a planning application has been made that will bring its history to an end: Change of use and alterations (including demolition of rear extension and erection of new single storey rear extension) of existing public house building to form 2 dwellings, and erection of 2(No.) 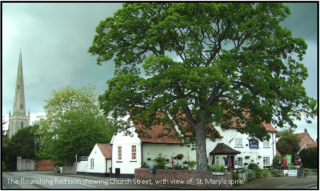 3-bedroom dwellings (Planning Applications, Bottesford Parish Council ). 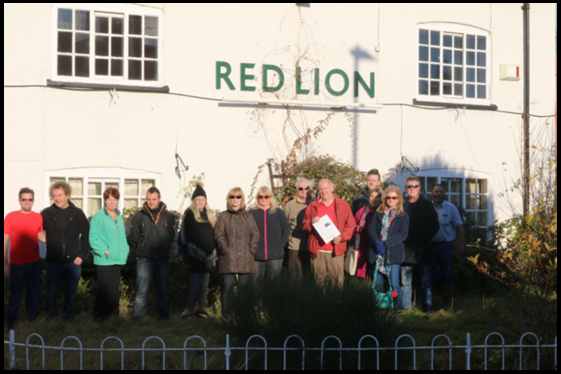 The ‘Friends of the Red Lion’ group have obtained registration of the pub as an Asset of Community Value. They are exploring the feasibility of running the Red Lion as a community pub. Community action has staved off the closure of the library. Can Bottesford summon up enough community spirit to keep the Red Lion going? English Heritage is the official guardian of England’s historic buildings. It states: “We are the public body that looks after England’s historic environment” and “We champion and protect historic places, helping people understand, value and care for them”. English Heritage maintains the register of buildings judged to be of historic and architectural importance to the nation – Listed Buildings.These are “buildings that are of special interest, warranting every effort to preserve them. The whole of the building is listed, including the interior. Objects, structures and affixed to a listed building or within its curtilage may also be listed. Curtilage is an area of land around a listed building”. 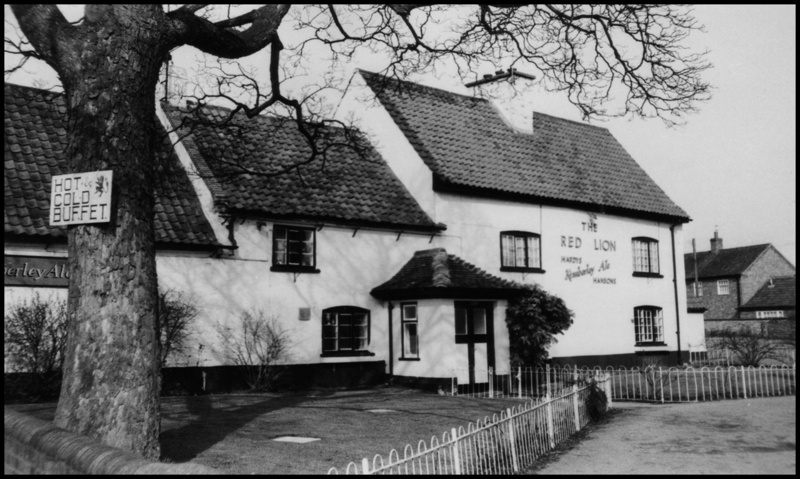 There are several Listed Buildings in Bottesford, including the Red Lion, whose entry No.1075098 says: The Red Lion, Grantham Road, Bottesford Grade II: Public house. Mid C18 with later extensions. Rendered and whitewashed brick. Pantile roofs. Main block to east: 2 storeys in 2 bays, central doorway blocked. Windows are 3-light casements, centre opening, under segmental heads. Gabled roof with large transverse stack in centre. To west is mid C18 2-storey house now with large hipped mid C20 porch attached to south front. One 3-light casement to each floor. Brick eaves cornice below gabled roof and internal gable-end stack to west. C19 extension abuts to west gable. Interior with C20 details. The central chimney is probably a survival of the older building, possibly a farmhouse, around which the Red Lion developed. The chimney breast in the lounge bars is huge with stone linen fold pillars on the fireplace. These were uncovered during renovations carried out in the 1980s. Mr. and Mrs. Beacroft (1962/1982) – Margot Beacroft’s licence was the last one to be issued at the old Belvoir Court House near the Castle. This page was added on 18/12/2017. What a sad piece of news. 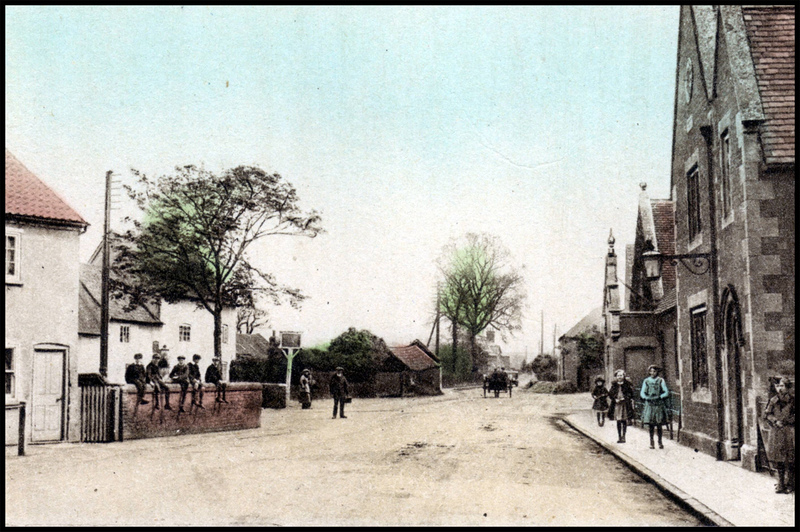 I recall all of we children coming out of school, opposite the Red Lion , one day to stand and cheer Harold McMillan who was, I believe , on his way to Grantham at the time. He stood up and made a short speech to us all from his open topped car but , naturally , I can’t recall a word of it. The backdrop to this scene , which I can still see so clearly in my mind’s eye, was the Red Lion. 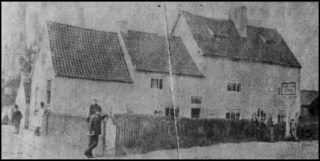 Found your site looking for location of Bottesford because I’m writing about Gooseberry Shows and you had one there in 1812 at the Red Lion. Inns were such important meeting places before the railways put them out of business. Not many left now sadly. Good luck. I found the report in the Nottingham Journal 8 August 1812. If you want a copy send me your address. 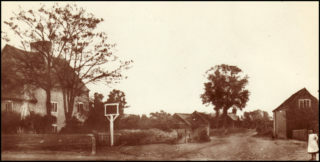 Gooseberry Shows were held annually, to find the heaviest berry, in every town and village throughout England from 1790 to 1914. So far I have recorded 1400 and the task goes on! I hope the Red Lion stays. My nana was the landlady there from 1962-82. My happy childhood memories were here especially spending Christmastime and New year’s in the pub. 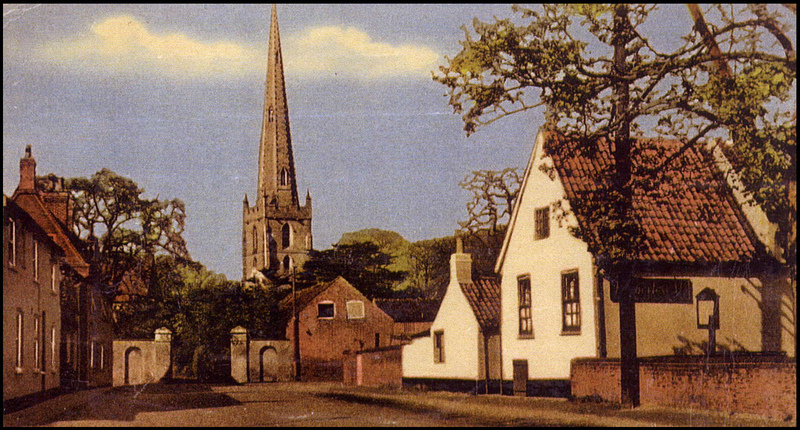 Can’t imagine Bottesford without it. So sad if it goes. I wish you well in your efforts to save the Red Lion.